Finally, on Theme Locations, select where you want it to appear- in this case, it is “ Header menu”. Do not forget to click Save Menu button. Click Add to menu then Save menu. Finally, on Theme Locations, select where you want them to appear – in this case is “ Menu display on left sidebar”. Don’t forget to hit Save. Additional setting : Add icons in front of the page’s name. + Choose Screen option button. + Tick the CSS Classes option. + Visit the following link: http://fortawesome.github.io/Font-Awesome/icons/. + Choose an icon that you like, copy the text and paste it in the CSS Classes section. • You can do similar settings for the others. 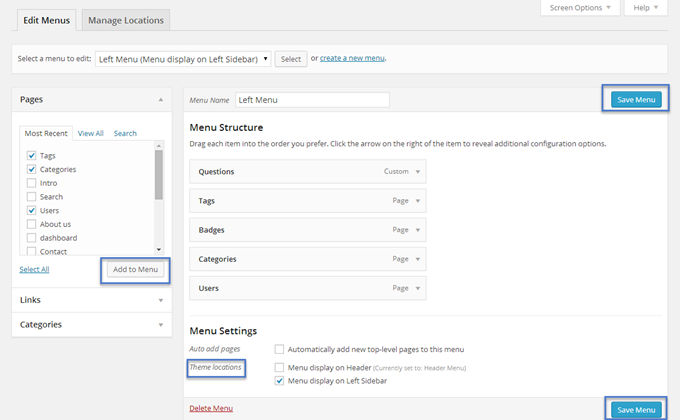 After completing your settings, the Left menu will be displayed as below in the front-end. QA Recent Activities widget shows all new activities of the current logged user. So, it won’t show anything if you are not logged into any account. Also, the number of activities can set up by *Number of activities to display* option on the QA Recent Activities setting form. On the homepage, your user can click “View all” to check all his activities. As our default design, it displays on the Left sidebar and Blog's Left sidebar. QA Statistic widget helps admin count the number of questions and numbers of users on his site currently. You can show it on any supported sidebar of QAEngine. As default, it is on the Right sidebar. QA Tags widget lists all tags of your site and also the number of questions has been used for each tag. 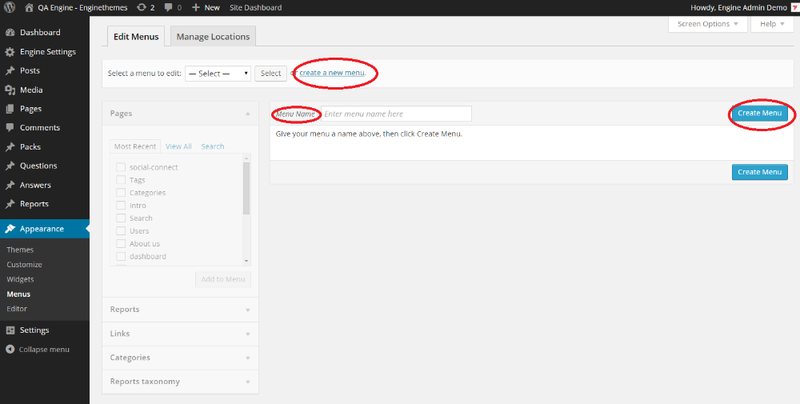 You can set the default number of tags list that will show on your tags list in the front-end. Clicking “See more tags” to view all tags. It should locate on the right sidebar if you wish to set up your site as our demo site. QA Latest Questions/Hot Questions widget will show all hot questions or latest questions as your need. You can also set up the number of questions to display. If you need to show the latest questions only, you should tick on the “Latest questions (sort by day)” and choose the date range as well. As dafault, it is on the right sidebar and blog's right sidebar. QA Related Questions widget will list all the same or quite similar questions for users to find the relevant ones. * Attention: If you want to let ads banners appear on your website, remember to use plugin AdRotate downloaded freely on wordpress.org. 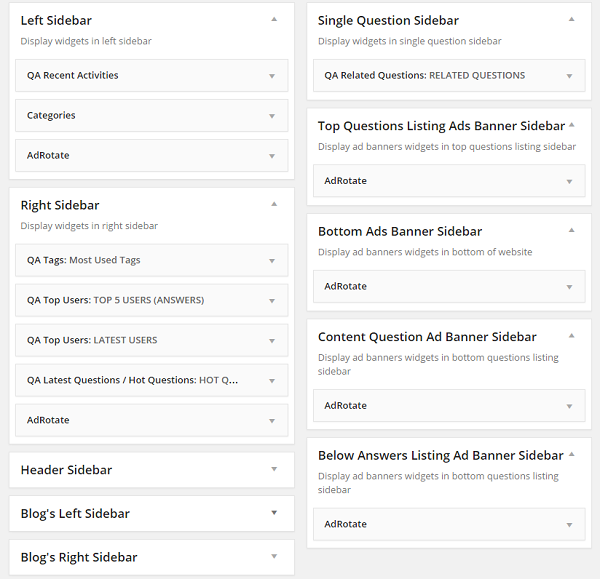 After that, you can make banners for ads and drag them into 2 sidebars Top Questions Listing Ads Banner or Bottom Ads Banner Sidebar. That is done and you can show ads banners on your website.